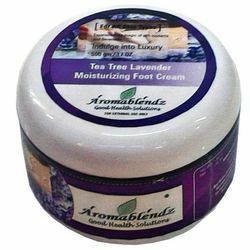 Our range of products include aromablendz tea tree & lavender moisturizing foot cream, aromablendz coffee foot cream and aromablendz peppermint foot cream. 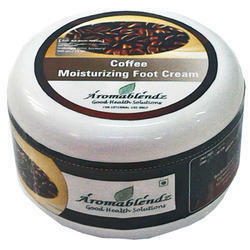 Use & Benefits: Deep moisturizing & non-greasy formula keeps your feet soft, supple & crack free. To be used as a moisturizer & finisher, the Step 3 of the foot treatment kit. Application: Apply generously all over the foot to get rid of cracks & calluses. To be used daily. Ingredients: Distilled water, lanette wax, coconut oil, shea butter, aloe vera, Lavender, Tea Tree, Vit E, Peppermint, Bergamot, Preservatives, Natural Fragrances & Excipients Caution: Avoid application on open wounds & cuts. 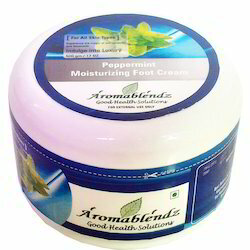 Looking for Aromablendz Foot Creams ?